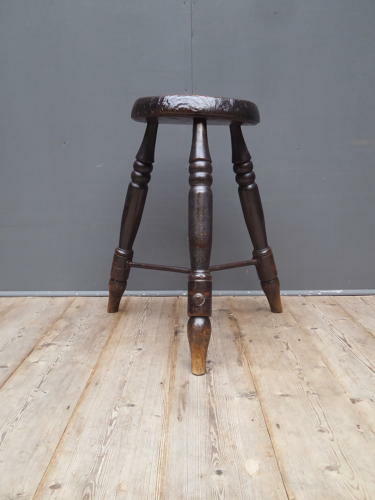 A beautiful example of an early antique lace makers stool. An absolute stunner with a wonderful primative look about it with the three turned legs supported by their original iron stretcher & the underside of the seat initialled with the letter 'W'. The diminutive concave seat boasts a beautiful deep grain which has developed through years of use & the whole piece comes in a beautiful coat of original paint with the perfect patina. Wear commensurate with age, excellent original condition. Seat 25cm across.